When a suture is not formed or closes too soon, it is called craniosynostosis. 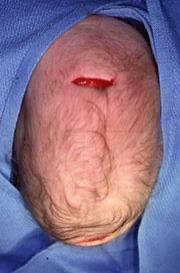 It is estimated that this defect occurs in one out of every 2000 live births. Craniosynostosis causes the head shape to be deformed, and in certain instances, can prevent the brain from having enough room to grow. 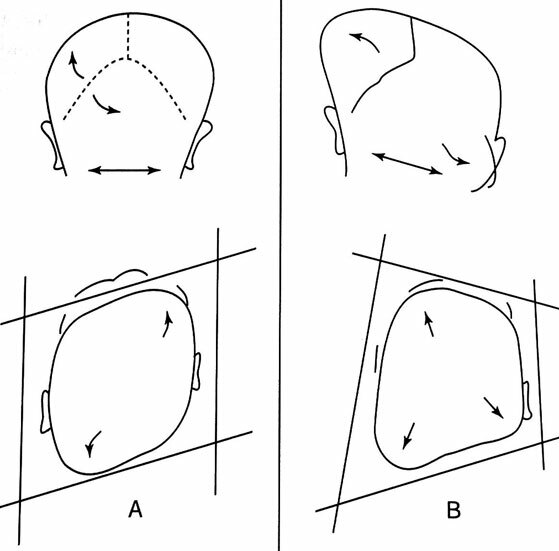 The specific abnormality of the head shape depends on which suture(s) is closed. An abnormal head shape is noticed after birth. The main sutures of the skull are the sagittal, metopic, coronal and lambdoid. Sagittal synostosis is the most common suture to close too soon, and it inhibits growth of the skull on both sides. The skull compensates by growing longer in the front and back, with a very large forehead and narrow pouched out back of the skull. This is called dolicocephaly (or scaphocephaly). 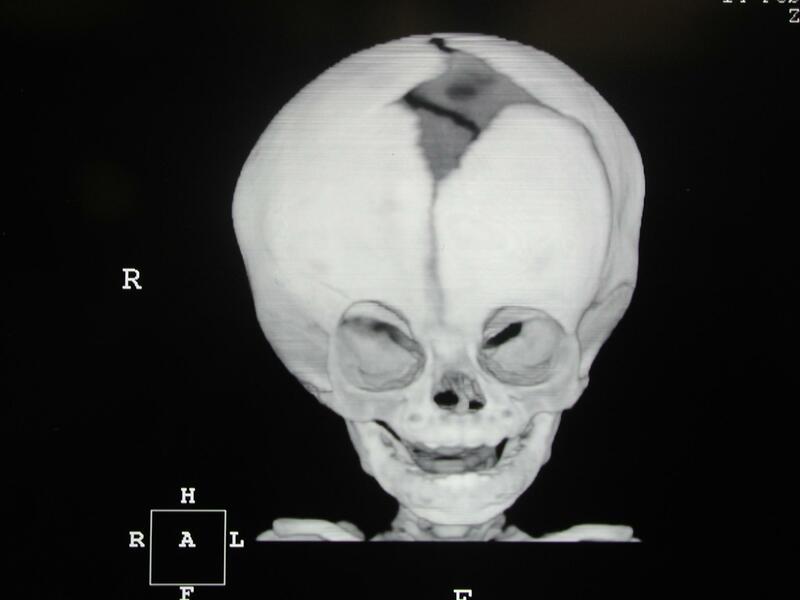 In addition to a deformed skull, there is a real risk that the brain may not have enough room to grow in sagittal synostosis. Elevated cranial pressure and subsequent neurological damage can occur. Coronal suture synostosis can involve one or both coronal sutures. However, it is much more common for only one coronal suture to be involved. This causes flatness on the forehead of the affected side, as well as noticing that the eye socket is pulled up on that side. When both coronal sutures are fused too soon, the skull cannot grow front to back. The skull instead grows side-to-side, which is called brachycephaly. When the metopic suture closes too soon, it may or may not be a problem. It is not a problem when the only noticeable feature is a ridge on the forehead. It is a problem when the forehead becomes keel shaped (just like the front of a boat). 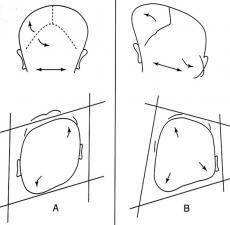 This is called trigonocephaly. Additionally, the eye sockets may not grow laterally, giving the appearance that the eyes are too close together. Also, the temporal area on each side of the skull (near the temples) cannot grow laterally, creating a hallow appearance in the child's temples. The last and least common suture to close too soon is the lambdoid suture. It causes flatness in the back of the head on the affected side. It can look like positional plagiocephaly, a benign flatness of the back of the head caused by babies spending too much time on the back of the head. On rare occasions, all the sutures in the skull are fused. This is a dangerous situation where pressure can build up in the brain and urgent treatment is needed in the few months after birth. 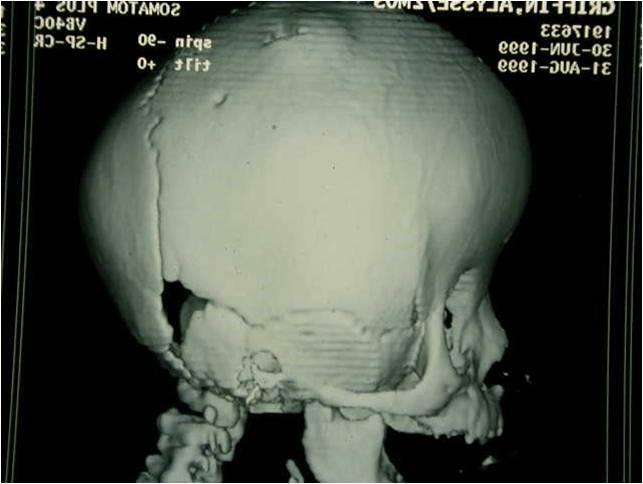 Treatment for craniosynostosis is required to prevent the psychosocial implications of having a major deformity and in many cases to prevent elevated brain pressure. Usually, the surgery is done by both a neurosurgeon and a plastic surgeon. Sometimes a craniofacial team coordinates the care of the child. There are two broad categories of surgery for craniosynostosis. Regardless of category, it is important to emphasize that while this is skull surgery and not brain surgery, the procedures are still considered major operations. The first category is called “minimally invasive” or endoscopic surgery. It is requires an early diagnosis as it is only done during the first few months of life. This procedure involves removing the fused suture and strips of bone with an endoscope or lighted retractor through two small incisions. This less invasive surgery is followed by several months in a specially designed helmet to help mold the child's skull into normal shape. We are the only team in Northern California with extensive experience with this surgery and our results have been excellent. 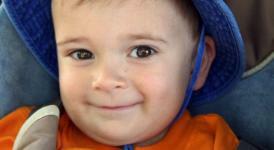 Read our coverage in the Contra Costa Times for more information, or watch Samuel's Craniosynostosis Story. The more invasive, or traditional repair, is typically done when the child is 6-12 months in age. In this involved surgery we rearrange the bones in the skull to achieve a normal skull shape and size. The time in the operating room and the time in the hospital are typically longer. In a traditional repair for older children, major portions of the skull are removed to mechanically reconstruct the skull and the incision is from the top of one ear to the top of the other. The incisions are all made behind the patient's hairline. The long-term outcomes for most patients with craniosynostosis are excellent. Surgery is generally recommended to reduce the chance of increased brain pressure from the skull not having enough room for the brain. This increased brain pressure can cause brain damage. Also, surgery is generally recommended to help these children have a normal head shape for self-esteem and social issues. 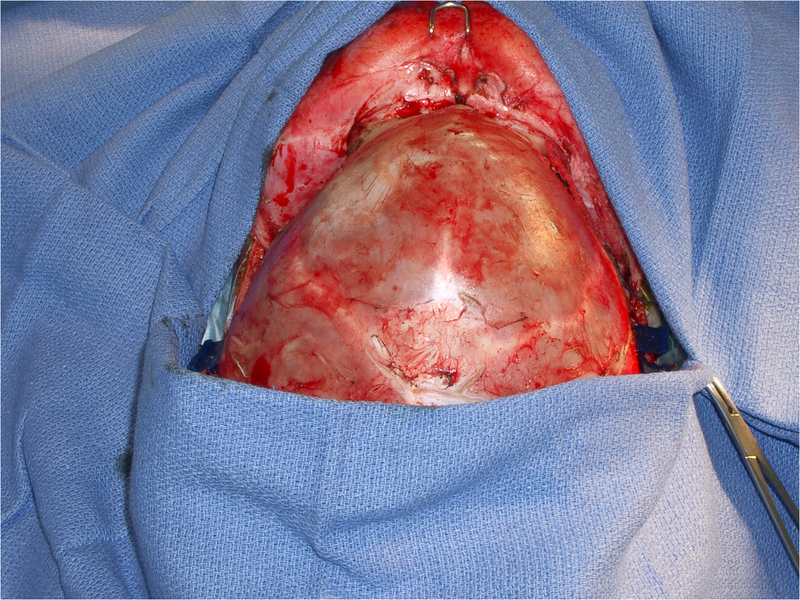 Without surgery the deformity of the head will continue to worsen as long as the head keeps growing in size.